The legendary Swiss watch brand Angular Momentum & Manu Propria presents its latest new product, called the Metiers d’Art “Takamaki”. It symbolizes the Japanese art Takamakie, which is also called a “relief maki-e”. Technique, which appeared in the Muromachi period (1336-1573 gg. ), is to apply multi-relief pattern with a mixture of metal powder, charcoal or clay, then covered with Japanese lacquer urushi. This process of applying layers with a thickness of 4.2 mm, lasts 90 days. Dial model Angular Momentum & Manu Propria decorated with relief mussels and snails, which are covered with black enamel and simulate the sand on the beach. In the “12 o’clock” is the aperture, through which the time display on the drive “a Souscription”. The original dial, which closes the sapphire crystal, placed in the round case diameter 43 mm and 14 mm thick stainless steel. 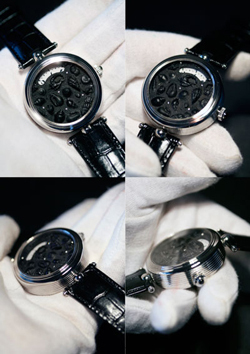 New Metiers d’Art “Takamaki” is equipped with the caliber FHF 96 with manual winding. Buy watches Metiers d’Art “Takamaki” of Angular Momentum & Manu Propria can on a black leather strap with stainless steel buckle.